A Magazine Devoted to the Brotherhood of Humanity, Theosophy in America, and the Study of Occult Science, Philosophy, and Aryan Science. 1886-1896 Monthly. New York, NY. Editor: William Q. Judge, editor and publisher. Succeeded by: Theosophy (1896-1897)->Universal Brotherhood (1897-1899)->Universal Brotherhood Path (1900-1903). 1/1, April 1886-March 1896. 32 pp., 6 x 9. 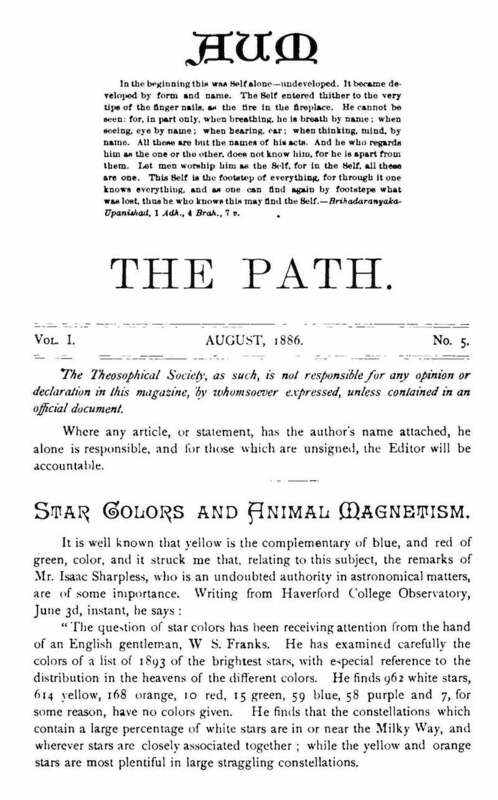 This is a Theosophical journal, but Judge's role in commenting on and participating in the spiritualist and occult controversies of the era make it important to include here. It has contributions by or excerpts from Judge (under his own name and several pseudonyms), Seth Pancoast, Mrs. J.W. Cables, W.P. Phelon, Stanley B. Sexton, C.H.A. Bjerregaard, J. Ralston Skinner, Baron J. Spedalieri, J.D. Buck, "Jasper Niemand" (Julia Campbell Ver Planck), Franz Hartmann, et al. The Campbell Theosophical Research Library has compiled a table of contents of the journal and published it online at austheos.org.au. Reprinted Edmonton Theosophical Society. The theosophy.net article index included.